In a prestigious contest run by 5280 Magazine every year, top doctors across the Denver Metro area are voted on by their peers in a variety of medical categories. 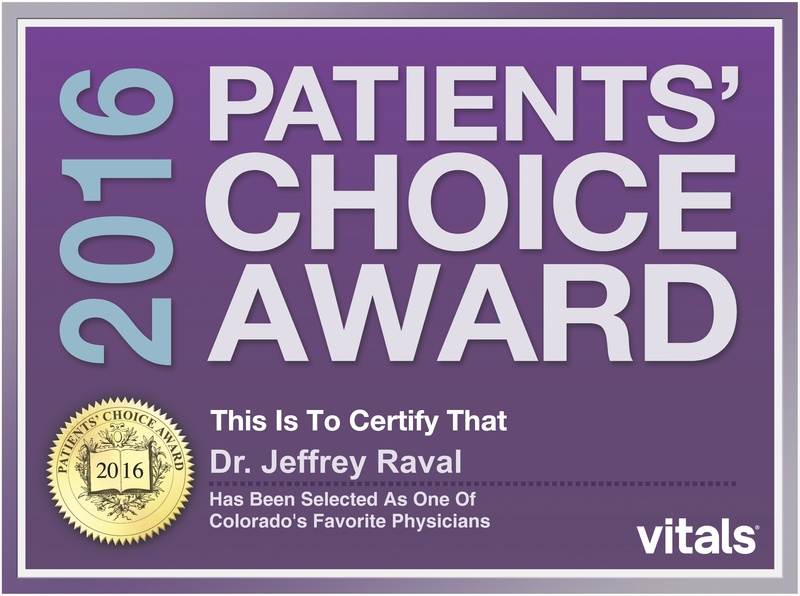 For the third year in a row, Dr. Raval was graciously bestowed the Top Doc title for Plastic Surgery of the Head and Neck. Learn more about this award by clicking below. Liquid Facelift on Colorado & Co. The liquid facelift just got even less painful. The FDA approved the addition of fast-acting numbing agent lidocane to injectable fillers. 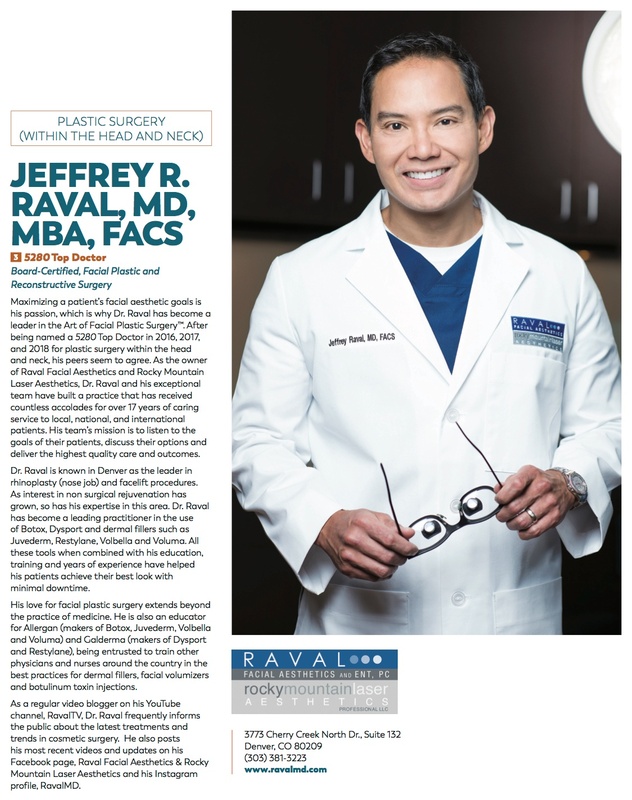 Dr. Raval pioneered this procedure at Raval Facial Aesthetics in Cherry Creek North, Denver, CO.
Restylane on Colorado & Co.
Eradicate deep creases in your skin and have younger looking lips using this injectable, the only injectable dermal filler containing NASHA, Non-Animal, Stabilized Hyaluronic Acid. This biodegradable gel is injected into the skin in tiny amounts with a very fine needle. The result is instantaneous and produces a long-lasting, natural enhancement, gentle and safe to your skin. Eye Rejuvenation on Colorado & Co.
Dr. Raval injects Restylane and Perlane to take years off of the eyes. The patient has already had a blephoplasty and is now seeking volume loss correction and wrinkle reduction. Dr. Raval will fill the festooning with injectable filler instead of removing it. 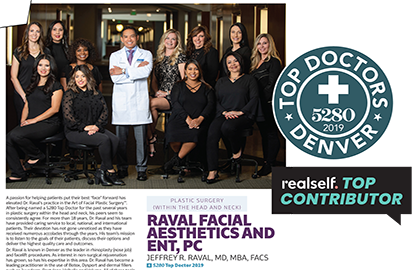 The Combo Lift on Colorado & Co.
Dr. Jeffrey Raval discusses the Combo Lift, a procedure that restores fullness to the face in just five days of downtime. Tailored to each individual patient, the mini lift and addition of volume using injectible fillers treats the gravity issues and loss of facial volume that inevitably come with aging. Dr. Raval discusses Botox on Colorado & Co.
and Neck Surgery, National Meeting. and Neck Surgery National meeting. “Oh, My Aching Sinuses!” Porter Hospital. *I have also given numerous presentations and seminars on the cosmetic uses of Botox. Davis R., Raval, J. Powered Instrumentation for Nasal Bone Reduction: Advantages and Indications Presented at the Eight International Symposium of Facial Plastic Surgery. May 2002. Publication pending in the Archives of Facial Plastics and Reconstructive Surgery. Raval J, Suskind D, Muntz H. An Unusual Case of Nontuberculous Mycobateria Rhinosimusitis in a Pediatric Cystic Fibrosis Patient, Abstract. American Society of Pediatric Otolaryngology Meeting (COSM). May 12,1998. Cary TE, Frank CJ, Raval JR, Jones JW McClatchey KD, Beals TF, Worsham MJ, Van Dyke DL. Identifying Genetic Changes Associated with Tumor Progression in Squamous Cell Carcinoma. Acta Otolaryngolgy (Stockh) 1997; Suppl 529;229-232. Jones JW, Raval JR, Beals TF, Worsham MJ, VanDyke DL, Esclamado RM, Wolf GT, Bradford CR, Miller T, Carey TE. Frequent Loss of Heterozygosity on Chromosome 18q in Squamous Cancers: Identification of Two Regions of Loss-18q11.1-12.3, and 18q21.1-23. Archives of Otolaryngology-Head and Neck Surgery. June 1997. Raval JR, Carey TE. Loss of Heterozygosity of DCC in Aggressive Squamous Cell Carcinomas: A Possible Prognostic Indicator. Oral Presentation. Fourth Research Workshop on the biology, Prevention and Treatment of Head and Neck Cancer. September 8, 1994. Abstract. Head and Neck, September 1994/October p.475. Raval JR, Joshua I, Webb RC, Bohr DF. Lanthanum Potentiation of the Vascular Response to a Protein Kinase C Activator in Genetically Hypertensive rates. Journal of Hypertension, 1989. 7(supp 6): S146-S147. Department of Otolaryngology, University of Michigan, Ann Arbor, Missouri. progression and development of atherosclerosis in the aging. Department of Pediatric Surgery, University of Michigan Medical Center, Ann Arbor, Missouri.